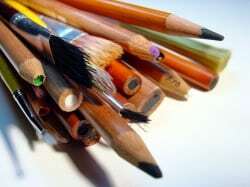 Pencils are the most popular drawing tool in the world.Being a very easy to use drawing medium, it is a drawing tool a lot of people are familiarized with. It is the perfect medium for anyone to start drawing or practice with mostly because of it is easy to maintain and is very durable when compared to other types of medium and it tools. Similar to paper, you have a variety of types or grades to choose from.Different pencil manufacturers have different types of pencils, so it is recommended that you test out several types of pencils with different grades and pick the one you are comfortable drawing with. Graphite grades ranges from 9H to 9B. “H” stands for “Hard” while “B” stand For “Black”. The rule that apply to both the “H” and “B” pencils is the same, which is – the higher the number is the harder/softer the pencil is. 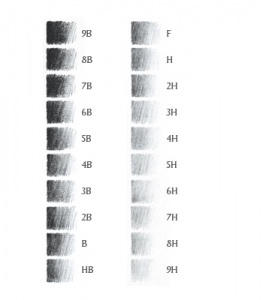 Because of its harder graphite, H or hard pencils are used to achieve a lighter,grayish strokes or lines.These pencils are commonly used to roughly sketch the outline of a figure or base structure followed by softer pencil grades for a more detail.This method is great if you are using wet mediums to colour your artwork as it lines will not be obvious when painted on top of it.One thing to remember is to not press too hard when using these type of pencils as it will leave marks on your paper even after you have erased it. Shading and darker lines should be done with softer pencils. The graphite of soft drawing pencils has more oil, making it darker, softer and breaks away easier than the “H” grade pencils.These type of pencils are great for shading and is usually used to draw on top of the outline or sketches made by harder grade pencils.Because it breaks away easily, it is hard to maintain the sharpness of soft drawing pencils and must be sharpened regularly especially if you are drawing out details. Before you buy your set of pencils, it is best that you try them out before purchasing them.Art supply stores usually provide test paper with different type of surfaces but in case they do not provide testing papers, bring along a piece of the drawing paper that you are currently using.Although this may be a bit of a hassle, it helps you choose the right pencil and avoid buying the ones that you do not need or rarely use. Markers are known for its versatility as a drawing and coloring medium. As markers don’t use separate inkwell, they are great for quick sketches because they give consistent line with little to no overlapping marks as well as shades of value by using your own strength. This makes markers great for sketching and drawing. Despite markers being a bit expensive (and having quite a serious odor) when compared to most drawing mediums, they are a good addition and supplement to your comic art tools. Before you purchase any marker to try out, be sure to buy the ones that are “permanent” as well as “light-fast” -(Indicates that it does not fade from light exposure). This can save you from water based elements that accidentally ends up on your drawings. If you have the budget for it, It is encouraged that you buy several markers with different size or width.With that you are equipped with markers that can cover large areas, thin lines as well as details. When you are planning to buy several markers for different usage, try to look out for narrow,medium as well as large markers and does not need to be from the same brand. Design Markers – Available in different choices of colors, design marker usually have two ends: one with a fine tip, the other a flat edge.Design markers have fantastic color shades from grey tones to skin color tones and is perfect for coloring flesh/skin as well as shading. Microns – Popular among designers and illustrators,these micron markers are excellent for drawing smooth consistent lines and are available in different sizes.These markers are also great for sketching. Brush Pens – The tip of the pen is shape like a brush (given the name) which enables you to create thick and thin strokes.These brush pens are not meant for filling in large areas as its tips does not last long when overused. There are two commonly used method for erasers.First is to clear out any mistake for the paper, second it to help create shading as well as reflections by erasing the part of the shading to create light reflections. The Kneaded Eraser – Used to clear stray strokes as well as light sketch lines, a kneaded eraser is great for clearing away in large area but because you can mold the eraser to a shape you want it also erases small areas of your drawing. Unlike ordinary eraser, a kneaded erasers does not produce dust or dirt. The Soft Plastic Eraser – Effective at removing darker,stronger or thicker lines and is great for clearing out a section of you drawing clean.Erasing with this eraser usually produces dirt or dust.This eraser can also damage some types of paper if you over-erase a single part of it. Having a sharp pencil or lead is essential in drawing, especially if you are working on detailed illustrations. Pencil Sharpeners – A standard pencil sharpener for wooden pencils.The blade on these sharpeners can become dull and that when you need to replace it.There are also sharpeners for lead holder mechanical pencils.